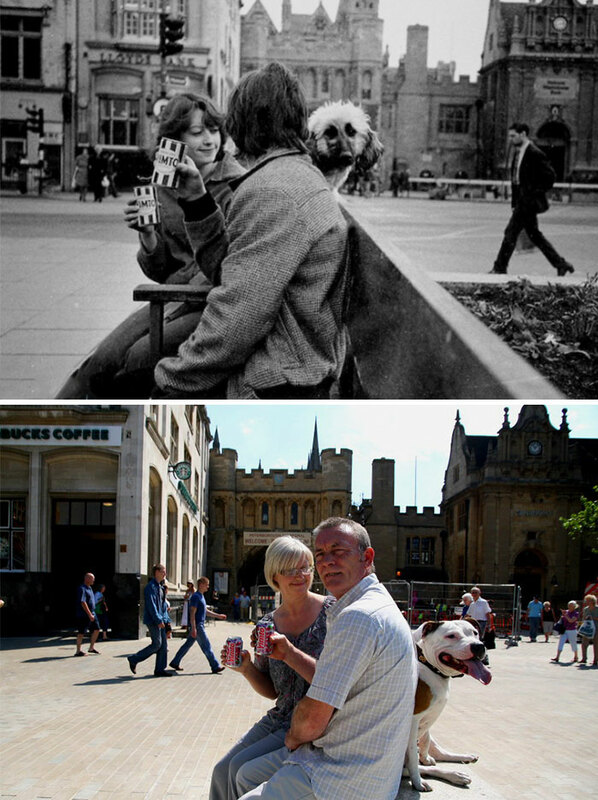 In the 1970s, 80s, and 90s, street photographer Chris Porsz wandered around the city of Peterborough, Cambridgeshire (Great Britain), photographing people. 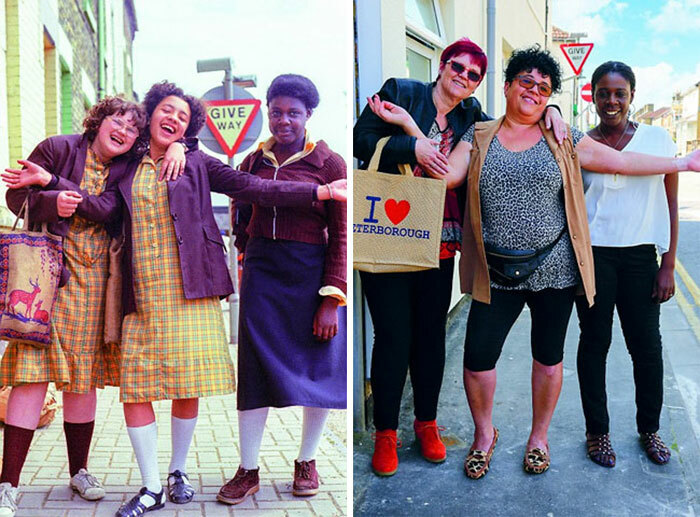 In the 1970s, 80s, and 90s, street photographer Chris Porsz wandered around the city of Peterborough, Cambridgeshire (Great Britain), photographing people. Now, after approximately 40 years, Porsz has tracked down those same people to recapture their pictures, creating 135 amazing reunions. Sometimes recreating the pics in the exact same spots, Porsz took pictures of everybody, including policemen, punks, couples or families. He has collected all the photos together and placed them in an album called 'Reunions'. That contains the characters' stories written by Jo Riley. Take a look at some of these wonderful photos and share your opinion! You can buy 'Reunions' through Porsz's website. 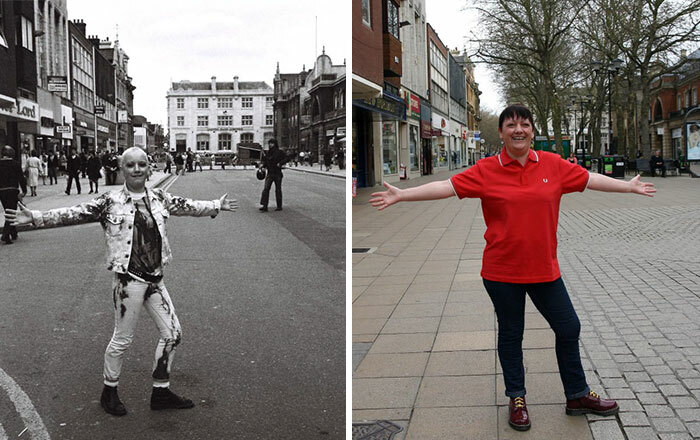 Punks Tina Tarr and her partner Dog were pictured near the Cathedral in Peterborough when Tina was 18. The couple left the city in the 1990s and went travelling. They have twins, but are no longer together. Tina now lives in Dorset and makes willow products and hosts weaving workshops. Dog does hedge laying and gardening and lives in South West Wales. 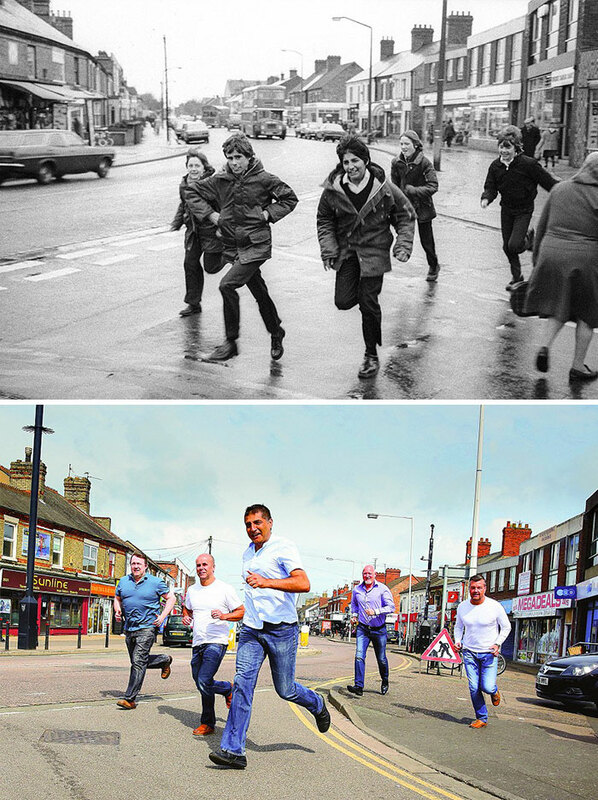 "I remember the photo being taken, it was a brilliant time. I had various styles of punk hair for quite a few years," said Tina. Dog added: "They were good times, I still had hair then". 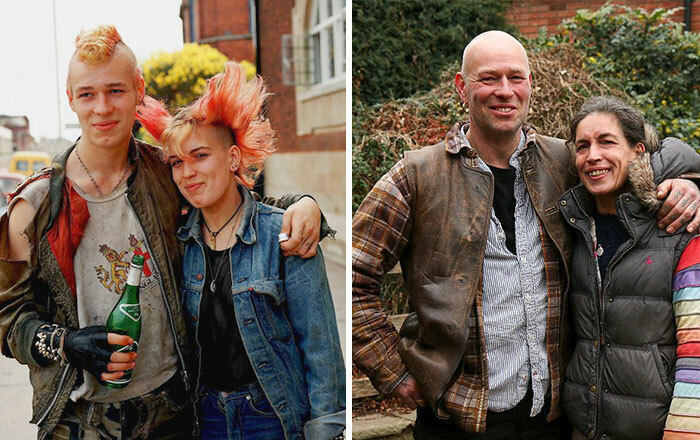 Andy, who has been married for 21 years and has a daughter, said: 'I remember playing the arcade game Phoenix, which involved birds hatching out of eggs.' Andy went into the Army after leaving school and drove trucks in the Transport Corps. 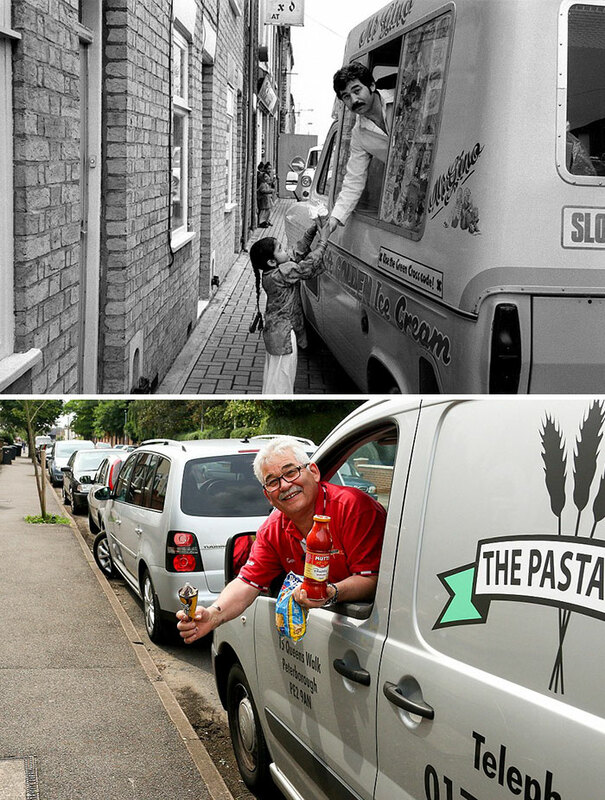 He left in 1987 and has been working for the Royal Mail in Werrington, near Peterborough, ever since. Richard is now an electrician in Peterborough and is married with two boys. He said: 'There were only about 70 of us in our school year and we were all really close. They were happy times.' 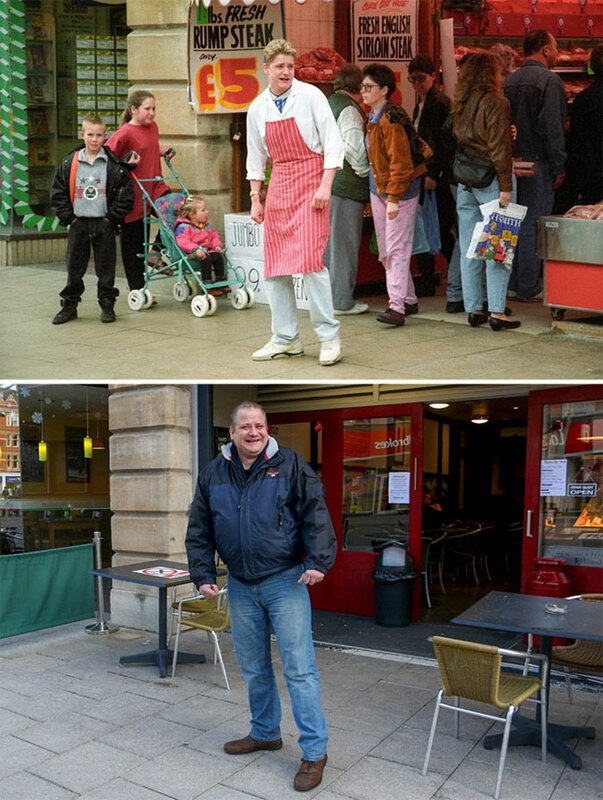 Tony James works as a stone cutter and has two children; Aaron works at Ikea and is married with three boys. Devinder moved to Yorkshire in 1986 and is married with two boys and works for the Housing Association. They've organised a school reunion and plan to keep in touch. 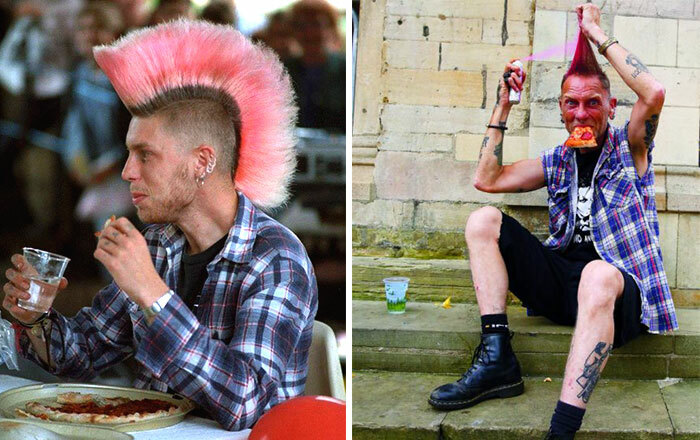 Punk Badger Farcue can still remember winning the Pizza Eating Competition in Cathedral Square. The contest was organized by Stefan Malajny, who ran the Papa Luigi pizza restaurant. Stefan said: 'I remember Badger managed to eat his pizza in about two minutes, which was very fast.' Badger was 20 at the time of the contest and worked as a labourer, building dry stone walls. He said: 'My friends encouraged me to enter and we had to try and eat a 12-inch cheese and tomato pizza as quickly as possible. I won and got a round of applause and front page of the local paper.' Badger, who has five children, moved to Somerset in 1991 and now tarmacs roads. 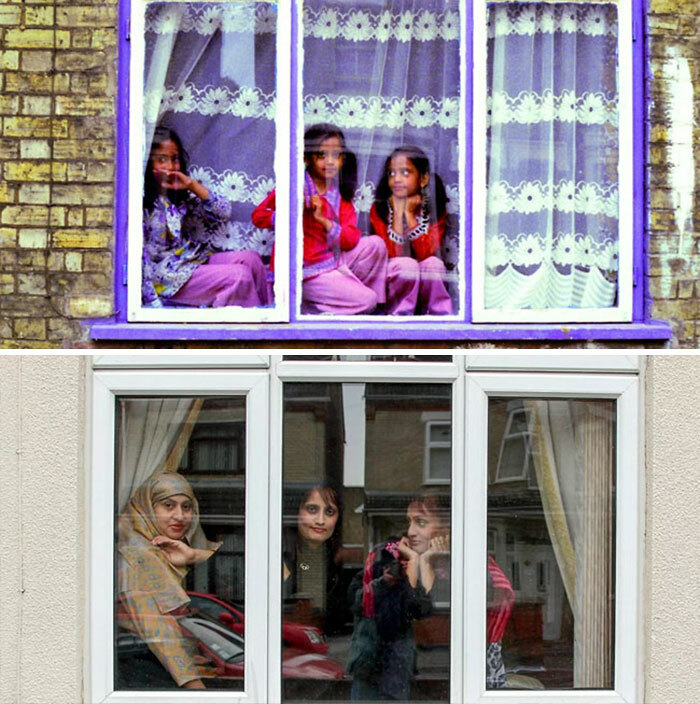 Left to right, Shehnaz Begum, her twin sister Rukhsana and their older sister Itrat were spotted sitting in the window of their house on Cromwell Road. 'We often used to perch in the window and watch what was going on in the road,' said Shehnaz. 'My twin sister and I were about seven and Itrat was nine. We loved riding our bikes with the other children in the street and were good friends with another set of twins. Mum said we were quite a handful'. 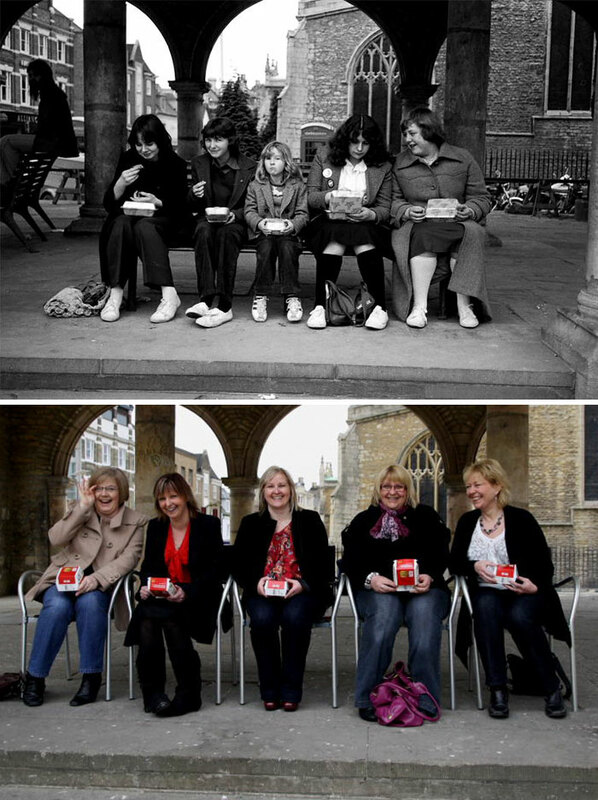 The three sisters still live in Peterborough and see each other regularly. Shehnaz, who is divorced, has a daughter and looks after elderly and disabled people, together with her twin, who is re-married and has five children. Itrat works for the post office and is married with six children. Steve Osborn was known as Metal Mickey in the 1980s as he broke both his legs several times in a series of motorbiking accidents and had plates and bolts put in them. He said: 'I even carried on riding my bike with my leg in a cast!'. 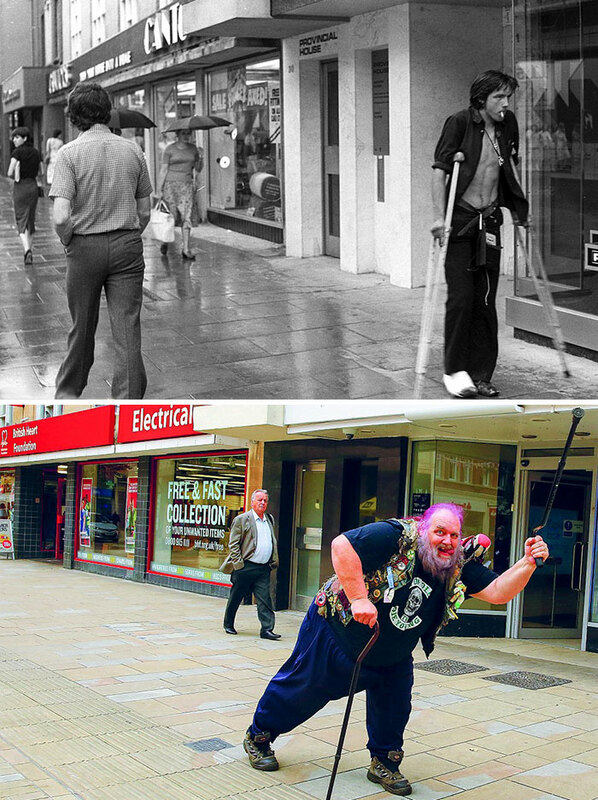 Steve, who now uses walking sticks to get around, lives in Spalding, Lincolnshire and is married. He had four children, but his son died in 2012. Steve plays the guitar with different bands and has raised more than £20,000 for the National Association of Bikers with a Disability. 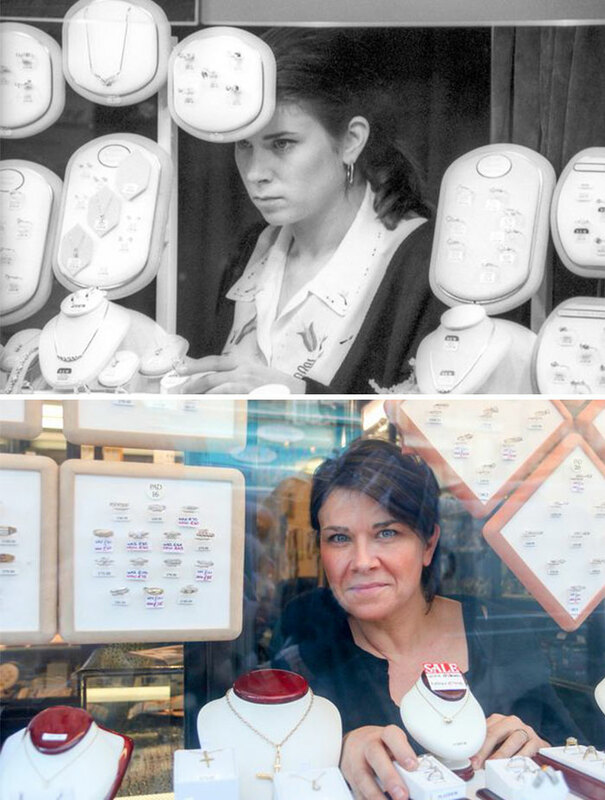 Vicki Gracey (nee Frost) worked as a sales assistant at a jewelry store in Queensgate Shopping Centre for two years. Vicki has since had jobs behind bars, in retail, hairdressing, and restaurants and currently deals with tenancy sustainability. She still lives in the city and is married with two children. 'I'm a people person and I've always had jobs which involve working with the public,' she said. Sandra Williams, Carmen Chin and Maureen Mayers were friends from County Grammar School but lost touch over the years and the school was converted into sheltered housing in 1985. 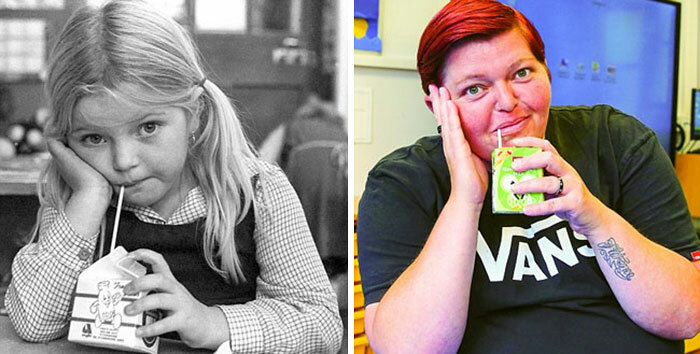 'Carmen was my best friend and lived in my road, so we were always together,' said Sandra, who is now married with four children and a step-daughter and works as a passenger assistant for disabled children and in a coffee shop. Carmen, who is married with four children and now lives in Lincolnshire, where she has a small holding said: 'I think we were the first year to go to the grammar school after it changed from being comprehensive.' Maureen, who still lives in Peterborough and has four children, had broken her right arm when the photo was taken and hid it behind her back. 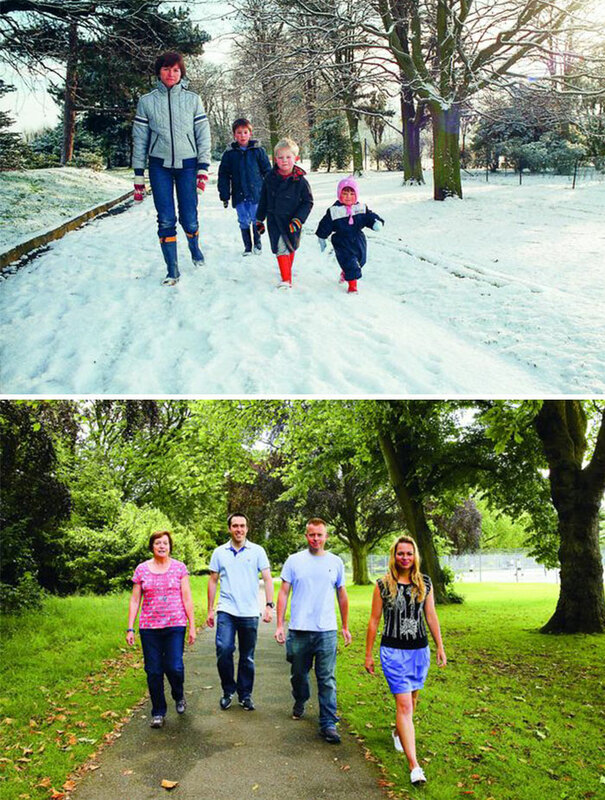 She said: 'We'd had freezing cold weather and we were playing tag and I slipped over on the ice'. 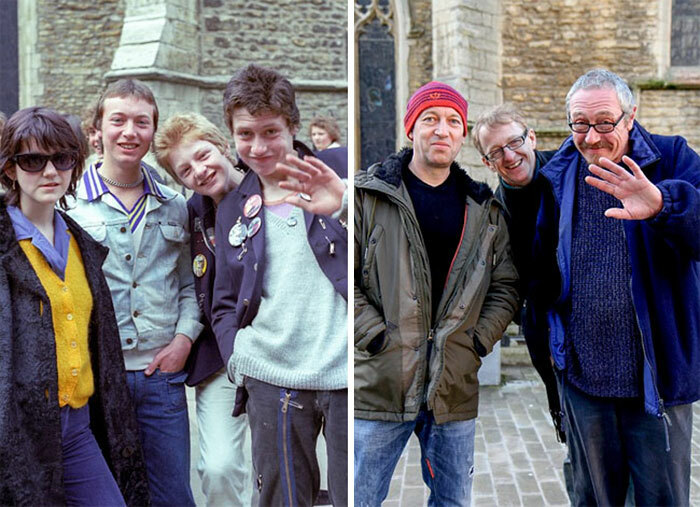 Punks (r to l) John Church, Gary Beckett, Ade Lawrence and Pippa Hodgson were pictured in Cathedral Square, wearing pin badges. John, who is now a painter and decorator in the city, said: 'The other lads were school friends and Pippa was a mutual friend. We used to hang out together and listen to punk music. I think I was about 15 and on the verge of becoming a punk.' 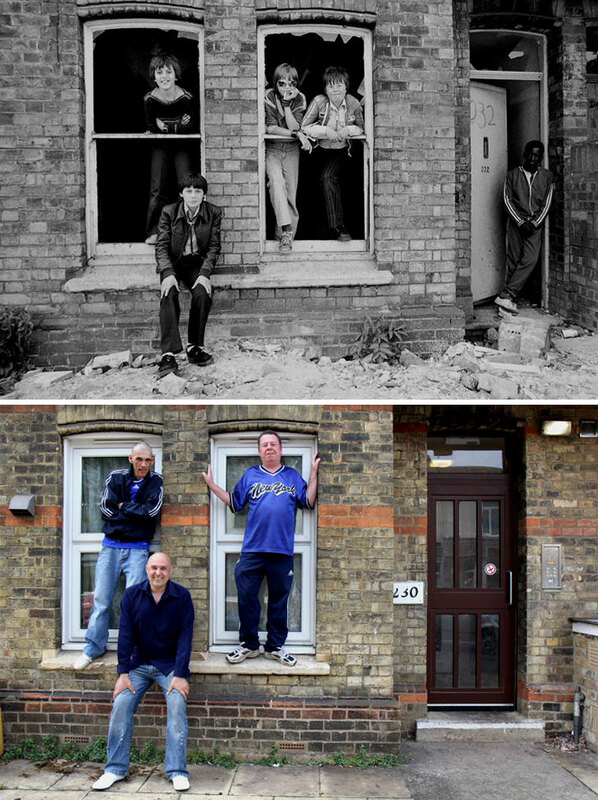 John is still friends with Ade and they play in a band together. Gary emigrated to Australia, where he works as a project manager and Pippa now lives in Spain. 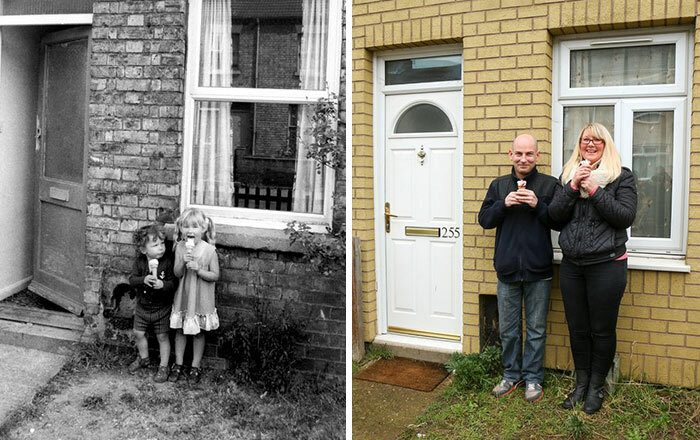 Donna Yarnell was five years old when she was photographed with her three-year-old brother Steven licking ice creams in their front garden. Her family moved out of the house two years later so it brought back lots of memories when the pair returned to the street in February 2015. 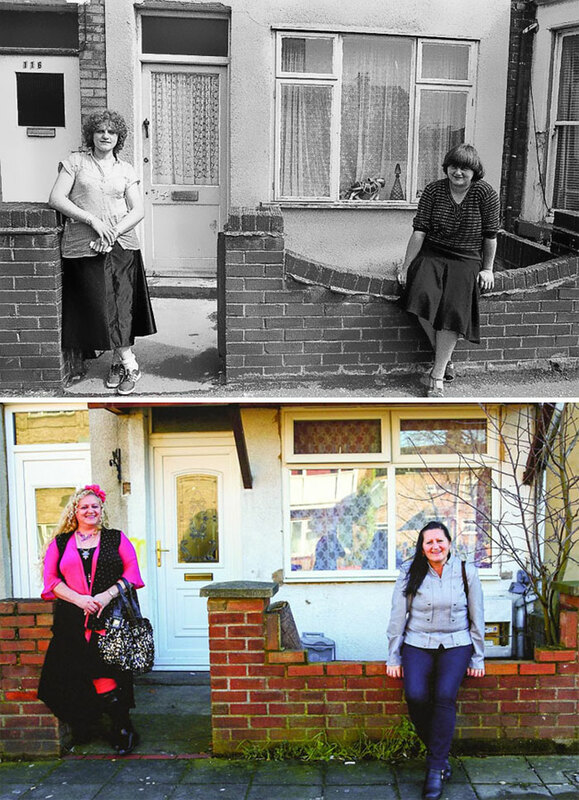 'I was really surprised because the front gate was exactly the same,' said Donna, who works in a pub, still lives in Peterborough and has four daughters. Brother Steven also lives in the city and has a son. 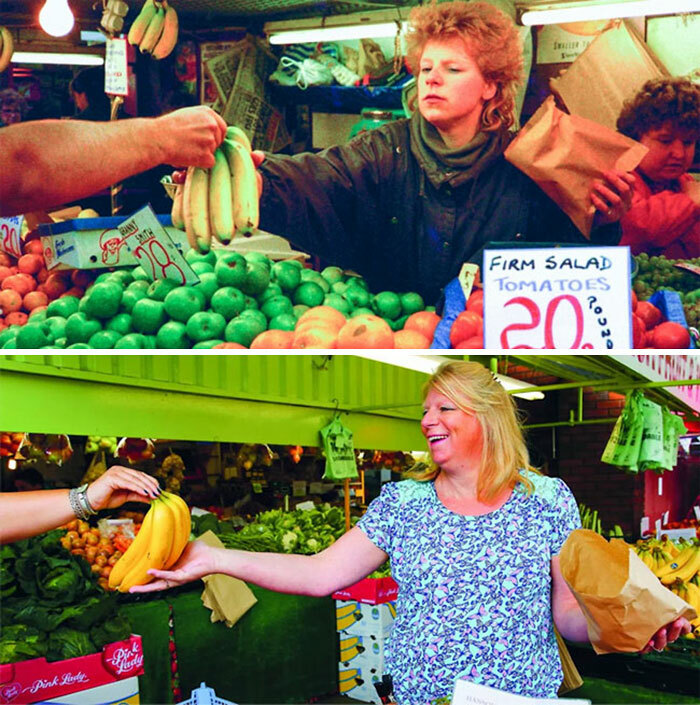 Tasbir Singh worked on a stall at the market for four years after leaving school. Tasbir's first job - Reunion, July 2016. He then worked for BT and Royal Mail, where he is today. 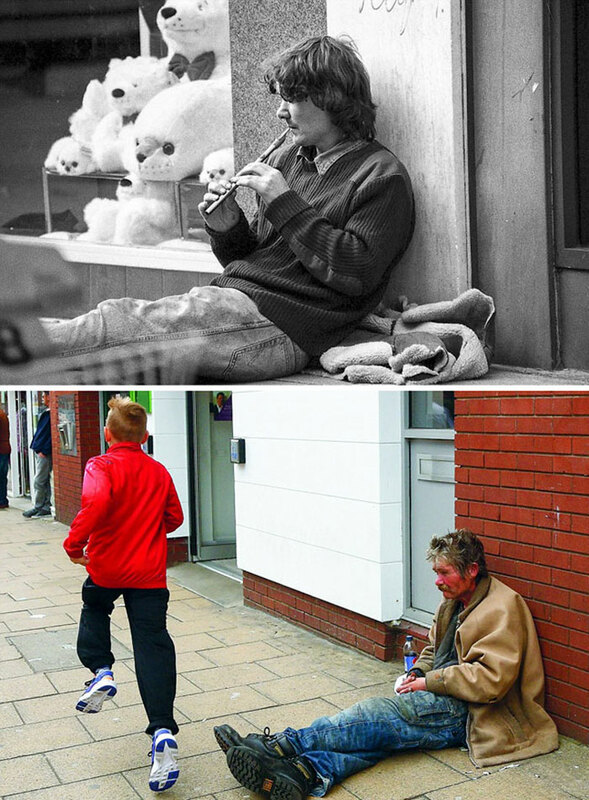 He still lives in the city and is married with three children and four grandchildren. 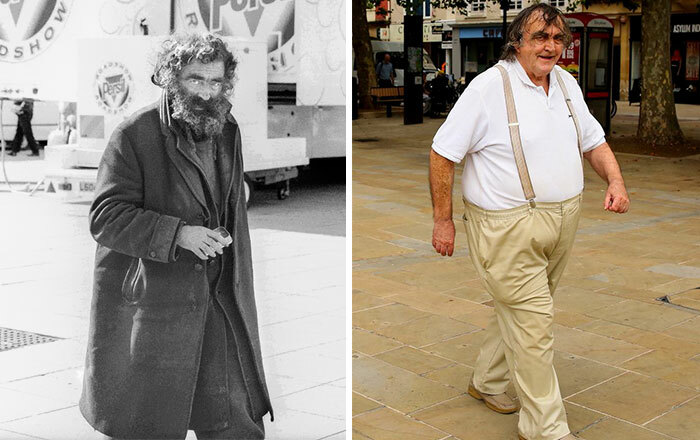 He said: 'I worked on the stall from the age of 18 until I was 22. It was hard working in all weather'. 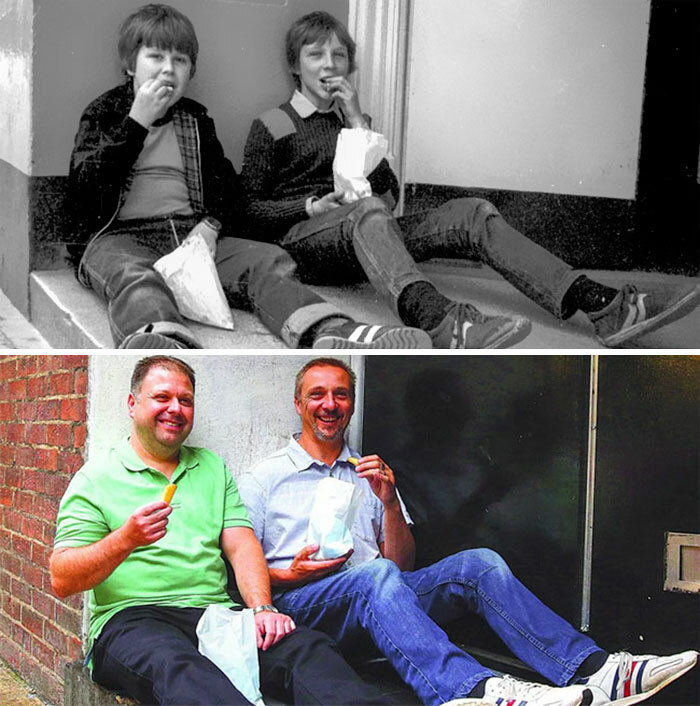 School friends Martin Coulson (left) and Andy Randall were eating chips bought from the arcade which has now been replaced with Wilkinsons. 'I think it must have been a Saturday and we'd been to the chip shop. The chips were a bit like McDonald's fries and were always good,' said Martin, who was a warehouse manager and is currently re-training. He is married with two children. Andy is a telematics engineer and is married with three children. He added: 'We were probably going around the toy shops together as we had a Scalextric track'. 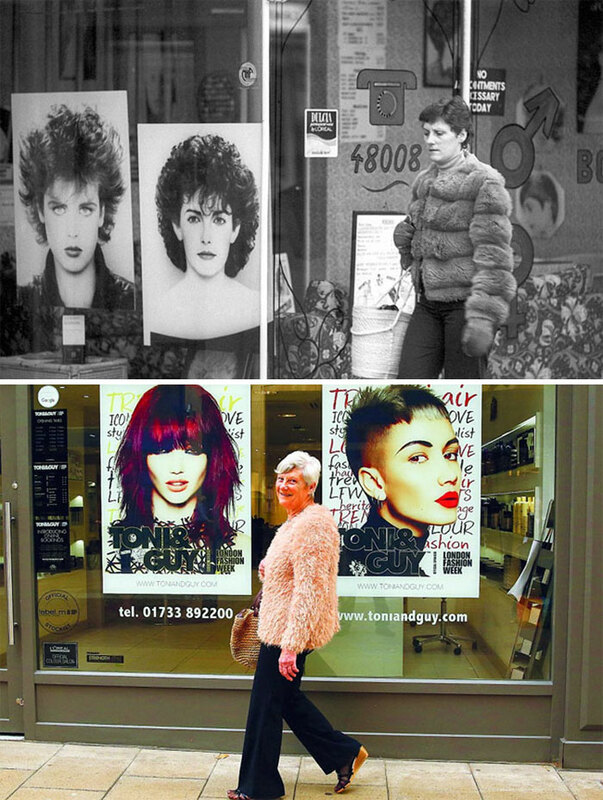 Dressed in a fur jacket and gloves, Sandra Burford was pictured going into a hairdresser. Hairdressers Shop - Reunion, June 2016. Sandra said: 'I used to go there occasionally to have my hair cut by the apprentice, because it worked out a bit cheaper.' She used to work at the Hotpoint factory, but is now retired. Sandra is widowed and has a daughter and three grandsons. The hairdressers has changed hands and is now a Toni & Guy. 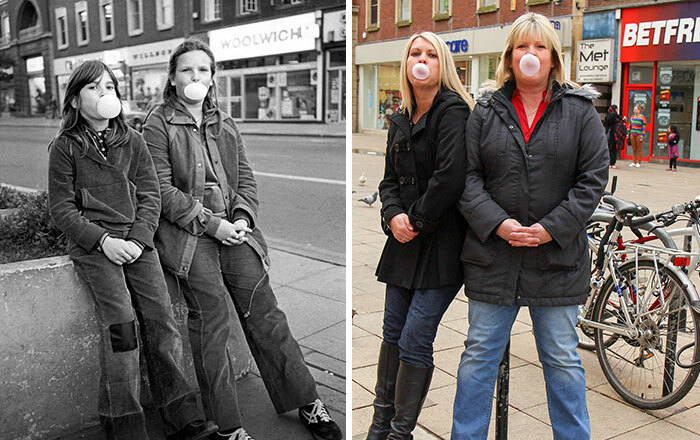 Sisters Anna (left) and Emma Hankins posed for a picture blowing bubbles with Hubba Bubba bubblegum in Bridge Street. Anna was 11 and Emma was 13 and the girls were waiting for their mum while she was shopping. 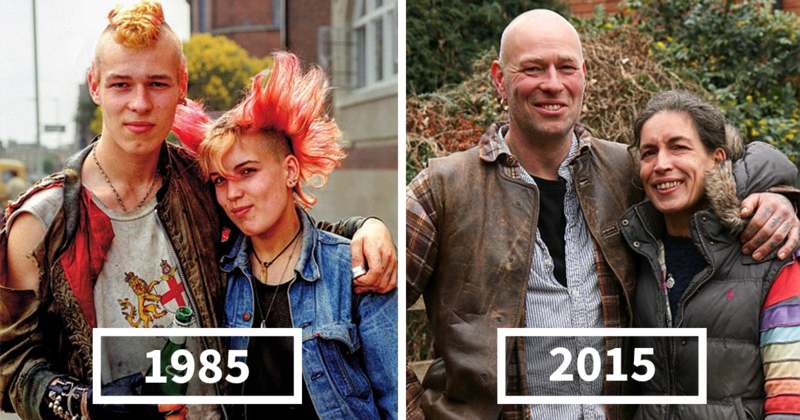 The siblings, who both went on to have careers in hairdressing, are now married and have families. 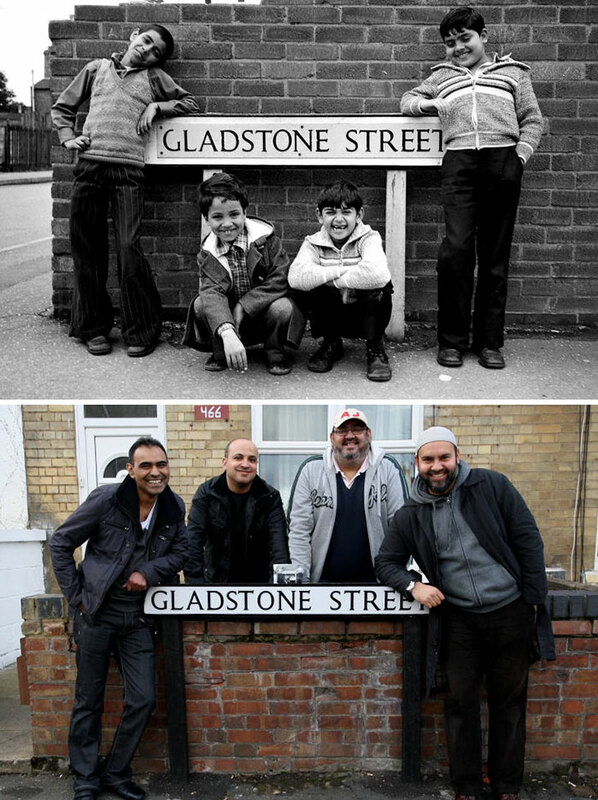 They still live in Peterborough and see each other regularly. Anna now works in a pharmacy and Emma works for the Ideal World shopping channel. 'It was hard trying to blow bubbles again after such a long time and took quite a few tries,' said Anna. Richard Price started work at the butchers when he left school at 15 and is pictured here selling meat outside the shop when he was about 17. In 2015. 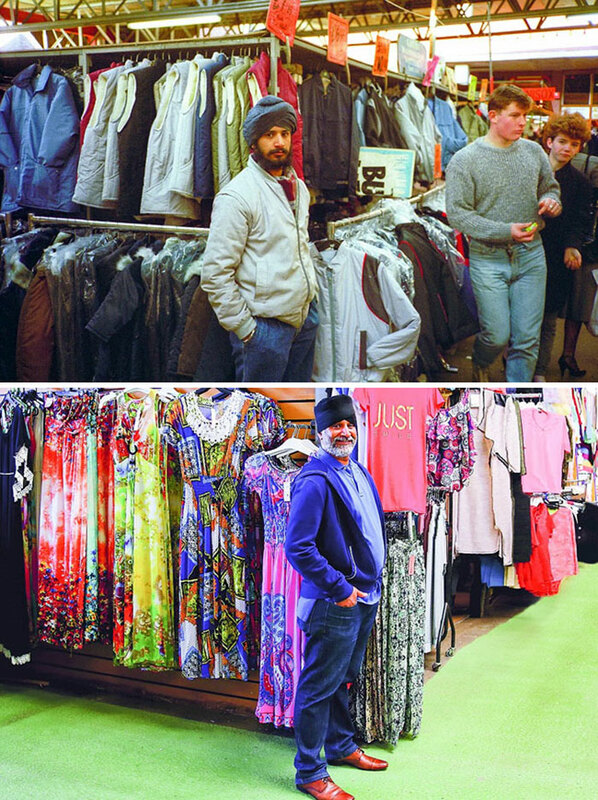 Richard worked at the shop for three years. He still lives in the city and works as an entertainer. The butchers' shop became a cafe. 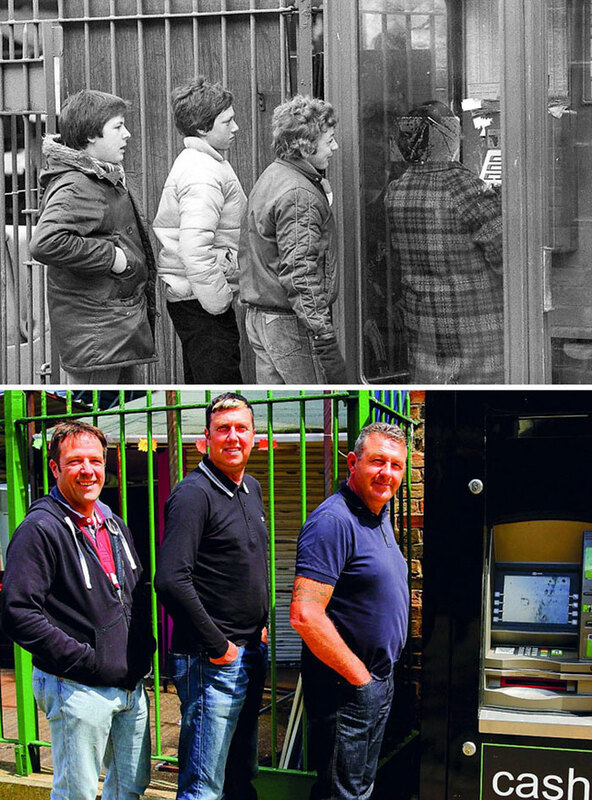 John Morris, Paul Barnard and Andrew Pollard (l to r) were seen queuing up to use the phone in Cattle Market Road. 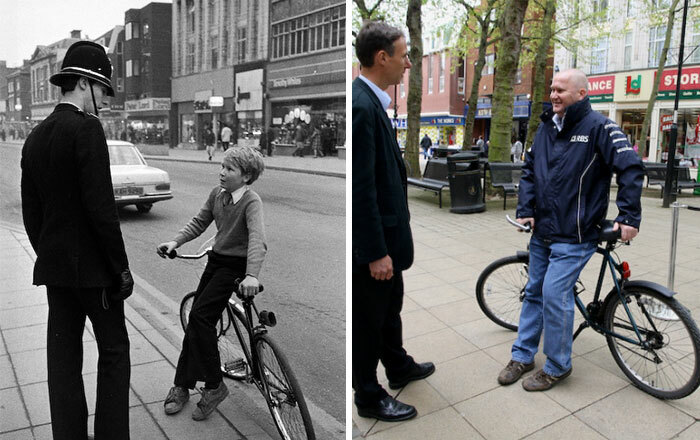 The school friends used to hang out together at weekends and often cycled into the city centre on their bikes. Now the phone box has been swapped for an ATM machine. John works locally as a plumber, is married and has two children. Paul, who is married with two children, works for a motor racing team and travels the globe looking after the car's wheels and tyres. Andrew, a window cleaner met his wife in Benidorm on an 18 to 30s holiday and moved to her home county of Essex so lost touch with the others. 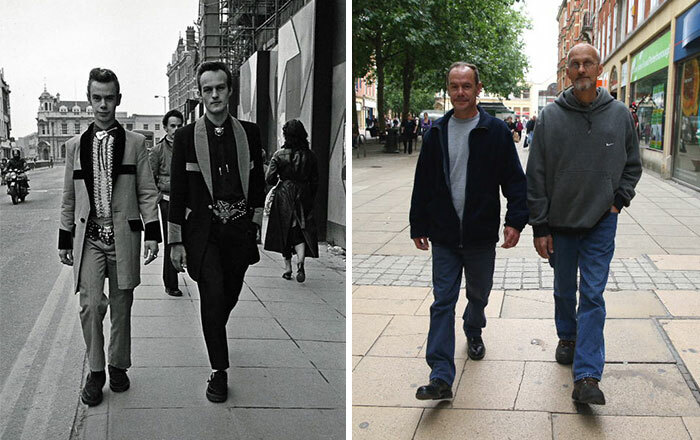 He said: 'I hadn't seen them for around 32 years - it was great to meet up again'.